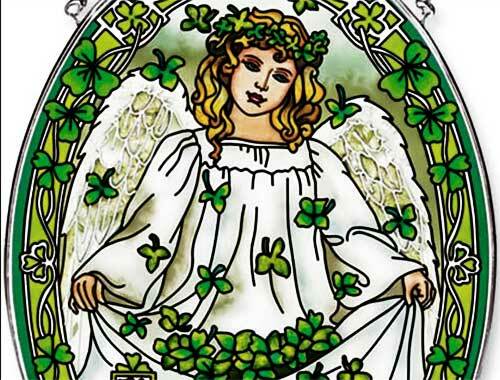 Irish suncatchers features stained glass that is accented with shamrocks and angels along with blessings and more. 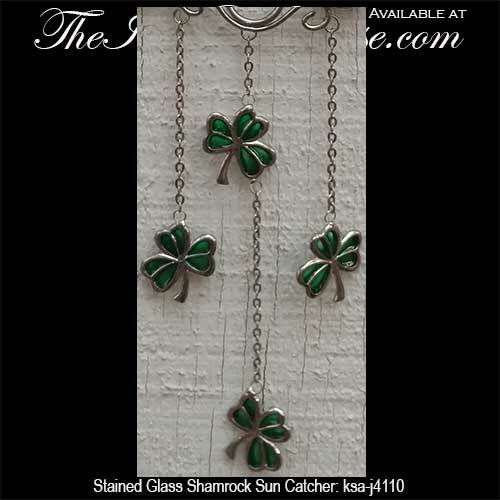 Your windows will shine brightly with the assortment of Irish suncatchers from The Irish Gift House. Our collection ranges from large to small designs that include Celtic stained glass along with the Claddagh and Gaelic sayings. This Celtic stained glass suncatcher features the Trinity along with a knot-work border. This Celtic stained glass suncatcher features sláinte along with a knot-work motif. This Celtic stained glass suncatcher features an Irish blessing along with with knot-work. This Celtic stained glass suncatcher features Fáilte, the Irish welcome, along with shamrocks. This stained glass Irish suncatcher features the Claddagh and it is enhanced with Celtic knot-work. This stained glass Irish suncatcher features shamrocks that are enhanced with Celtic knot-work. 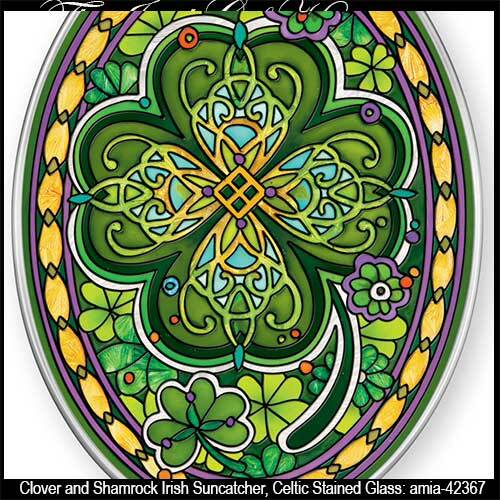 This Irish stained glass suncatcher features a large clover with a Celtic knot motif, along with shamrock accenting. This Celtic stained glass suncatcher features seven green shamrocks. 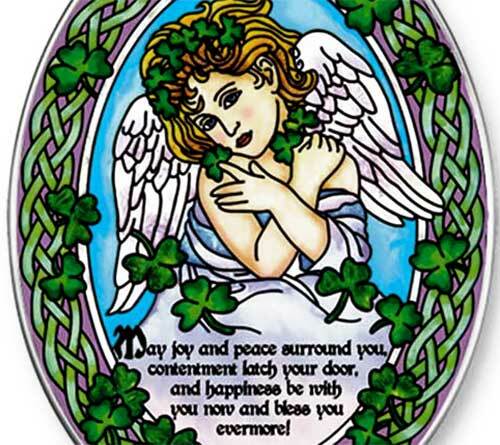 This stained glass suncatcher features an Irish blessing along with four leaf clovers. This Irish stained glass suncatcher features dragonflies and ladybugs in a field of shamrocks. This Irish stained glass suncatcher features shamrocks. This Irish stained glass suncatcher features a shower of shamrocks raining down from a leprechaun's hat. This Celtic stained glass suncatcher features a frog holding a shamrock. 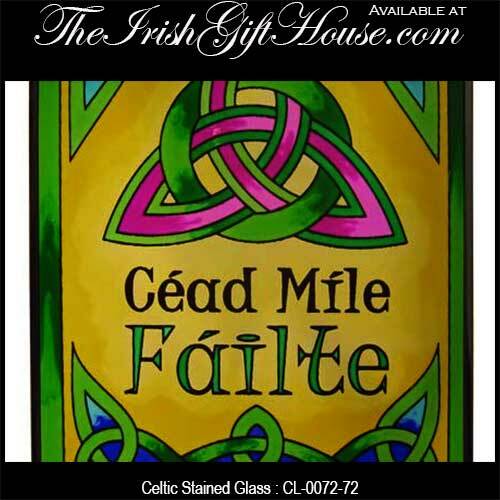 The Irish Gift House offers many additional Celtic stained glass designs that you may also see in our Irish lamp section along with our Celtic fireplace screens page. Most of our Irish night lights are also enhanced with stained glass along with some of our Irish wind chimes. 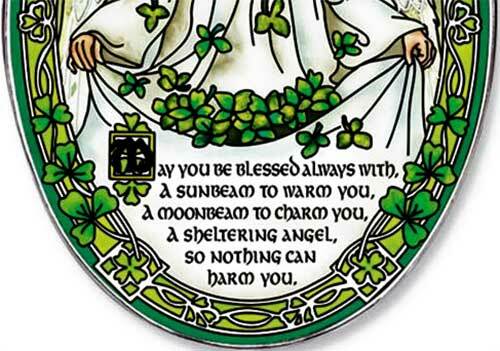 Several of our Irish suncatchers feature a blessing, but to see an even greater selection of toasts and sayings you will want to visit our collection of Irish blessing plaques.